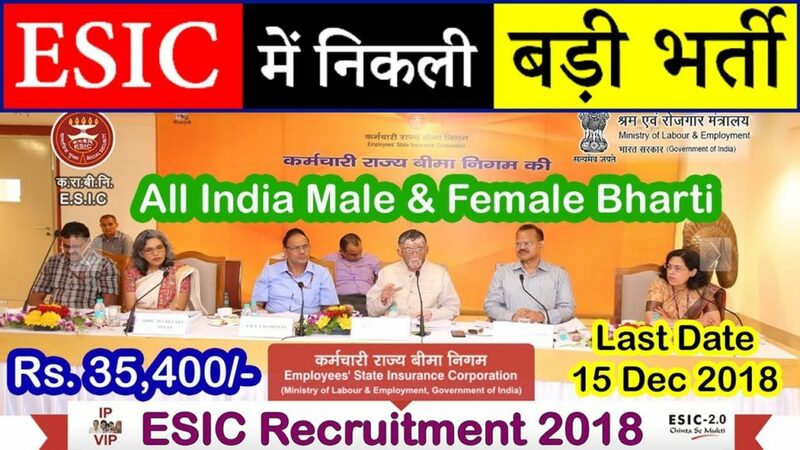 Employees’ State Insurance Corporation (ESIC) on Monday released the admit card for the computer based test (examination) to recruit Junior Engineer (Civil) and Junior Engineer (Electrical). The examination will be held on January 24, 2019. Candidates can download the e-admit card for appearing in Computer Based test by visiting the official website of ESIC at www.esic.nic.in. Here is the direct link to download the ESIC admit card for Junior Engineer Exam. The candidates should carefully read the instruction given in the e-admit card before appearing in the examination. They are also advised to keep visiting ESIC Website (www.esic.nic.in) for further updates/instructions in respect of above recruitment. ESIC will not entertain any request for change of examination centre. Click on the link for ESIC Junior Engineer Exam running on top of the page. Note: Visit official website of ESIC for latest news and updates. Good News for Job hunters and Job Seekers in Civil Engineer Department! Are you searching for a great place to find ESIC Junior Engineer Jobs in Civil Engineer Department . Do you willing to get a high paying Jobs in Civil Engineer Department ,Than your search ends here. Career Result is the most leading resource where you can grab the Best Jobs in Civil Engineer Department according to your qualification and choice. Get it right the first time. Change Your Life, Start your Successful Career with Career Result. Get more information about Civil Engineer Department Govt Jobs Vacancy and Apply For Vanancies in ESIC Junior Engineer . Civil Engineer Department Jobs for candidates who completed 10th, 12th, ITI, diploma, engineering. Search and apply for बिहारसरकारीनौकरी Civil Engineer Department jobs which are related to your qualification ESIC Junior Engineer Online Form dated recently. Latest announced Civil Engineer Department Jobs Vacancy first on Careerresult.in with Job description and eligibility criteria. Below list contains the current Live 1,198 Civil Engineer Department Jobs vacancies across various companies. Every Year Civil Engineer Department recruits thousands of candidates for various state Government departments like Social Welfare, Industries, Human Resources Development, Banking, Railway, Police, Agriculture, Defence, Teaching, Tourism, Transport, Urban Development, Rural Development, Finance sector and much more. In this page, Candidates can explore thousands of latest Jobs in Civil Engineer Department under various sectors. Notification on Civil Engineer Department coming राजस्थान सरकारी नौकरी Jobs in Civil Engineer Department are also Civil Engineer Department dated in this page immediately. In this page, you can accurately grasp all department-wise, Location-wise, Education-wise Jobs in Civil Engineer Department 2018. Also You can gather major city-wise Jobs in Civil Engineer Department here. Civil Engineer Department govt publishes various govt jobs consistently for various sectors like Engineering, Banking, IT etc. All the interested candidates can check this page on regular basis to get updated for all the current vacancy news in ESIC Junior Engineer. You can also bookmark this page so that you can reach this page easily and fast. Links for Civil Engineer Department Jobs Government Jobs Official Notification, Online Application Form is provided in this page itself, which paves you to apply for the latest Jobs in Civil Engineer Department in an easiest way. Moreover furthermore you can discover many Similar Jobs in various Government sectors in this page itself. Civil Engineer Department government is publishing various government jobs consistently for 10th/12th and graduate students, All the latest vacancies in Civil Engineer Department are being published in our portal. Please visit our site employment-news.net regularly for latest govt jobs news. In order to attain Civil Engineer Department Jobs , Careerresult will help you with its resources like placement papers, Aptitude skill test, Interview questions and answers, Mock Tests, Current Affairs, etc. So make use of it and clench your dream Jobs in Civil Engineer Department . How to get ESIC Junior Engineer Govt Jobs 2018 latest notification on your phone. To know immediately about the Civil Engineer Department coming Jobs in ESIC Junior Engineer 2018 in the near future, you can Subscribe CareerResult to your Email. Surely you can get instant alerts related to Civil Engineer Department upcoming Jobs in Civil Engineer Department 2018.